“Christopher Columbus, the discoverer of America, was not the son of a wool-worker of Genoa, as always it has been supported in Italy, nor of a prince of Granada, like is said in Spain, but he was a natural son of Pope Innocent VIII and of an Italian noblewoman... and its history is closely interlaced with the city of Pavia. He’d studied at the Carthusia of Pavia, between 12 and 14 years of his age, that is between 1458 and 1461. The truth is hidden in a shrine, at the Library of the University of Pavia”. This is, in synthesis, the content of letters that Mr. Renato Biagioli – a professor in Rome, author of theatre pieces and voted to solve the historical dilemma about the origins of the great navigator ‑ has recently sent to Mr. Roberto Schmid, chancellor of the University of Pavia, and to the genetist Carlo Alberto Redi. Biagioli invited Schmid and Redi to carry on genetic analysis of the bony fragments contained in the shrine. “This would change the fates of Italy, of the Vatican and of the whole world”, he said. “The analysis of Dna extracted from those rests ‑ Biagioli writes ‑ will reveal the truth to the world. I think sponsors can be found, for a research that could rewrite the history of the mankind”. The case of “Columbus at Pavia” came up to the public attention in the last twelve years, when the journalist Marino Ruggero, writed the book “Christopher Columbus and Pope betrayed” (1991 and 1997). The investigators ask to confront the Dna of the bony rests guarded in the shrine with the biological heritage of the noble family Cybo, the one of John Baptist Cybo, cardinal of Genoa, who became Pope with the name of Innocent VIII. Some of them live in Milan, Novara and Rome and they would be ready to offer themselves for an analysis, able to show in a new light the discovery of America. If a genetic consanguinity was tried, even though remote, between ashes of Columbus and the biological material of a successor of Innocent VIII, the evidence would be had a relationship trace. Renato Biagioli has written a book: “If God wants (and Church consents...) Saint Christopher Columbus, son of Pope Innocent VIII and man sent by the Church”. This book was presented in Rome, 2003, December 19. “At the University of Granada, the anatomist José Antonio Lorente Acosta carried on a comparison of the Dna drawn from the rests of Christopher Columbus with the one of Diego, his presumed brother. That comparison could reserve a surprise and open an international case, if it’ll deny the traditional conviction that Christopher and Diego had in common the father and the mother: Domenico Columbus, a wool manufacturer in Genoa, and Susanna Fontanarossa”. Biagioli is sure that the great Christopher, differently from his brother, did rise from a noble lineage. As Pope Pio IX said in 1851: “When some documents will be known. About the part of the New World that Christopher Columbus discovered, it will be evident that Columbus had in his enterprise the aid of this apostolic Center, and over all a great support by the clergy”. “The laboratory of Biology of the development of the University of Pavia – says professor Carlo Alberto Redi ‑ has the competences in order to lead paleobiology researches. We have carried out studies about ancient Dna with the etnographic museum Pigorini of Rome, on the necropolis of Sacred ‑ Island; (Ostia, near Rome). We are therefore ready”. 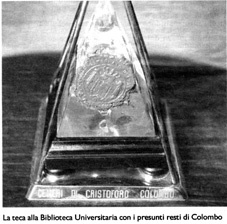 In september 2002, in the eve of the launch by the Spanish of the great research on Columbus, Redi launched an appeal to the Italian scientific community, in the imminence of the 510th anniversary of the discovery of the America: “We must search to try the Dna of Christopher Columbus in Pavia and Genoa. I propose to study an Italian project in order to finally resolve the two enigmas that accompany the world from an half millenium: first: if Columbus is fron Genoa or Spanish, and second: if he is buried in the cathedral of Seville or at Santo Domingo”. Carlo Alberto Redi had not hidden his perplexities about the tests carried on in Seville and thinks they will not resolve the enigma of Columbus: “Dna to confront, in the Spanish project, are the ones of the presumed father and of the brother of the navigator. If the genetic analysis will ever say that the ashes are of a son of the prince of Viana, we will always have the doubt that they are the true ashes of Christopher Columbus. The verdict of the Dna, in this case, would be therefore an element in favor of a Spanish Columbus, but it will not be conclusive, and the problem of the origins of the discoverer of America would remain unsolved”. "Very different ‑ Redi continues ‑ would be the perspectives of an Italian project of research about the origins of Columbus, by the ashes conserved at Pavia. We have, in fact, the ashes of the presumed bones of Columbus, from which we can try to extract the Dna. He do not have to answer to the Spanish, but really to reveal the true Christopher Columbus, in the interest of all, Italian and Spanish”. A - Columbus was from Genoa: this is the hypothesis supported by the Italians. Columbus (Genoa 1451‑Valladolid 1506) would have been the son of the wool-worker Domenico Columbus and of Susanna Fontanarossa. He emigrated to Portugal and after to Spain, where at last he obtained average for the travel towards the New World, by the kings of Castile Ferdinand and Isabel. The shrine with his ashes came to the University Library of Pavia August 1880 and was sent by the archbishop of Santo Domingo, the friar Cocchia. In this hypothesis, Colombo would be buried in Santo Domingo. B - Spanish Columbus. This is the thesis that the Spanish project tries to demonstrate. Sponsored by the regional government of Andalusia (Spain), launched in 2002 by the University of Granada and entrusted to the anatomist José Antonio Lorente, of the Laboratory of genetic Identification. In this hypothesis, Columbus’ name would really be Cristobal Colon and would be born in the island of Majorca (Baleari) from Margalida Colon and the prince of Viana, related with the catholic Kings of Castile, confined on that island by his father. Columbus would be buried in the cathedral of Seville. C – Columbus was a son of Pope Innocent VIII. It is the hesis advanced many years ago by Ruggero Marino, a former journalist of Rome, and supported by Renato Biagioli. “The history of the discovery of the America? An operation of marketing and disinformation. Marketing in favor of the Kings of Spain, Isabel and Ferdinand. Of disinformation towards Christopher Columbus and Innocent VIII, the Pope ‘desaparecido’”. Ruggero Marino, 63 years, is working from 13 years on the life of the discoverer of America and of his real “sponsor”: the Church of Rome. “The participation of Pope Innocent VIII, a man of the family Cybo, from Genoa, as a “sponsor” of the discovery of America: my book is also a rehabilitation of a Pope cancelled from the history, who financed the shipment of Columbus. This had never previously been written”. On the tombstone of Innocent VIII in Vatican, you can read that America was discovered during his reign. But Columbus left 1492, August 3, and Innocent VIII died one week before! How is it possible? ”Only an apparent mistake”, says Marino. One of the most fascinating mysteries of the history. The famous map of Piri Re’is, drawn in the 1513, shows much more of America than that was “officially” discovered, above all of the South. In the writings, it says litterally that: “Christopher Columbus discovered these coasts in the year 890 of the Hegira”. That is in 1485, a.D. It seems that Piri Re’is map confirms the tombstone of Innocent, in Vatican”. It means that Columbus had discovered America before 1492? ”Exactly: seven years before, under the reign of Pope Innocent VIII. But it is absurd to continue to assert a possible supremacy about the discovery of the America. We will never know who was the first, if Columbus or others. The fact remains that Columbus has been the last one, the definitive one, who it has changed the history of the world. His “discovery” remains as the more important. All the history of the discovery of America, must be rewrited”. Mr. Marino, when did you write about Christopher Columbus, as a son of Pope Innocent VIII? ”In 1997, when I wrote the 4th edition of my “Christopher Columbus and the betrayed Pope”, with a presentation of Franco Cardini”. ”In fact, I do not know where Columbus was born, but I’m sure he was Italian, a great Italian. Therefore as a great Pope was Pope Cybo, almost deleted by the history”. Cfr. La Provincia Pavese, 2003, december 23, 27, 28, 31.